1. Ultra Fast: Data transfer of up to 5Gbps on 7 ports gets you synced up and on your way. 2. It's small enough for travel, and able to meet your connectivity needs, you will also easy to keep your workspace clean and organized. 4. Guaranteed Reliability: We are confident with our porducts because we are the factory who can actually produce by ourselves, if there is any problem, just contact us and we will solve your problem. For a stable connection, the devices connected to the 4 Ports USB 3.0 Hub must not exceed a combined current of 5 volts 900 mAh. External hard-drives should be connected to an external power source. With DC power input port to support your high capacity HDD or mobile USB DVD drivers work more stable. 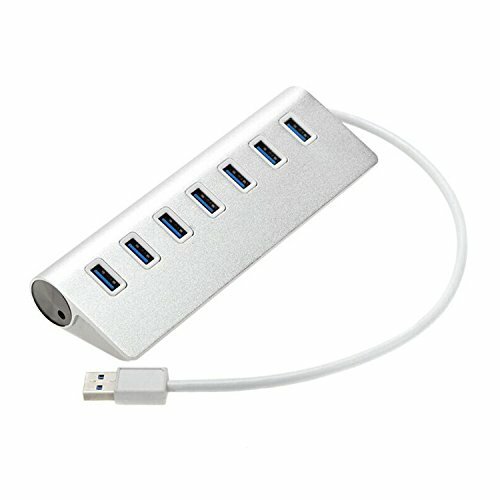 7 high speed USB 3.0 ports to your computer - Up to 5Gbps data transfer rate. If you have any questions about this product by RANHE, contact us by completing and submitting the form below. If you are looking for a specif part number, please include it with your message.